My hubby and I also got to see a New York Liberty game against the Washington Mystics. 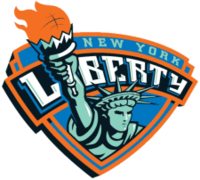 The Liberty managed to win but they play so poorly it may behoove them to lose so they get a crack at a higher draft pick next year. At least that’s what my husband says; I tend to be far more negative about the team as a whole. I wasn’t as successful nutritionally as I ate out several times over the past few days. Hopefully, I can get that under control today. We went to see the New York Liberty play against the Los Angeles Sparks this evening. The first quarter made me reconsider why we continue to support the Liberty.